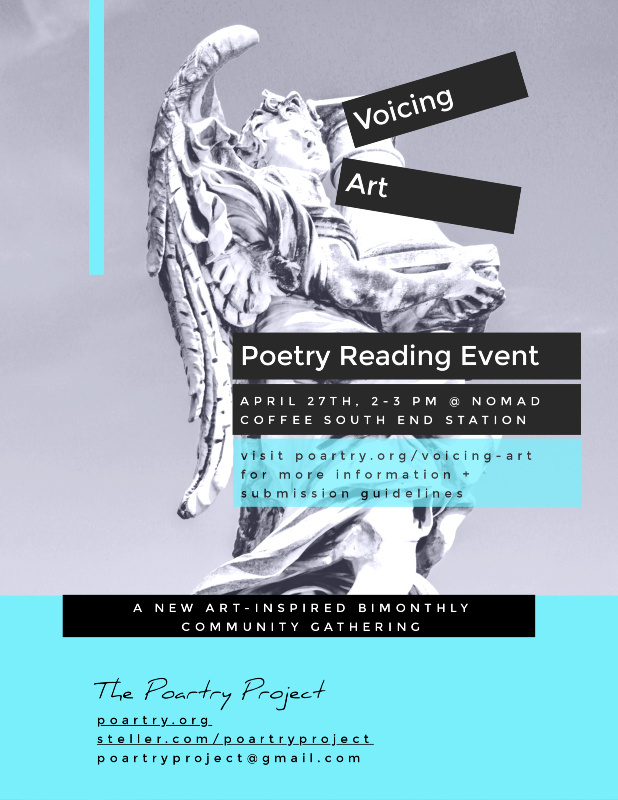 “Voicing Art” is a new inclusive bi-monthly community poetry reading event hosted by The Poartry Project. We invite and encourage the community (all ages – especially young children and teens, all experience levels – including none) to write and submit original poetry or prose inspired by the current art exhibit at FLYNNDOG Gallery at South End Station to be shared publicly at the reading. The subject matter for our first reading is the paintings of Roger Coleman and the photography of Peter Curtis. Food and drink available for purchase before/during reading from Nomad Coffee. Poets and writers interested in submitting work should visit poartry.org/voicing-art. Submission deadline: April 11. Questions: poartryproject@gmail.com.